In Australia the BS and AS flange standards are essentially the same but have been metricated. Consequently metric sizes are stated as ‘DN’ (Nominal Diameter) in mm. Equivalent imperial sizing is rounded to the nearest multiple of 25mm (for 2” and over) as below. However the actual dimensions and bore sizes have not changed. ‘NB’ (Nominal Bore) is also sometimes used when referring to valve sizes. The most common flanging used in Australia in oil, gas and mining is now ANSI flanging to ANSI B16.5. However in general industrial, commercial and waste/water industries AS2129 Table flanging is the most common. Increasingly European PN rated flanges are also specified in BS4504 as well as AS4331 and EN 1092-1. BS4504 is now obsolete and is replaced by EN 1092 which is listed in British Standards as BS-EN 1092. 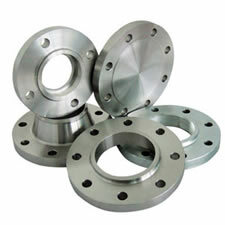 EN 1092 evolved from DIN 2501 which became part of ISO 7005, then EN 1092 was created as the standard for DIN based flanges. (BS4504 flanges were generally the same as the old DIN 2501 specification, but the new EN 1092 standard covers a wider range). EN 1092-1 is for steel flanges, EN 1092-2 is for iron flanges, EN 1092-3 is for alloy flanges, EN 1092-4 is for aluminium alloy flanges. PN stands for Nominal Pressure and roughly equates to the number of bar i.e. the cold working pressure of PN10 is 10 bar. Ratings range from PN2.5 to PN420. The latest Australian standard AS4331 references this rating system (PN2.5 to PN420). AS4331 is a reproduction of ISO 7005 which is based on the American and European flange systems PN20, PN50, PN 110, PN 150, PN 260 and PN 420 steel flanges are “designed to be interchangeable” with flanges to American standards ANSI/ASME B16.5 and MSS SP44; they are not identical but are “deemed to comply” with dimensions specified in ANSI/ASME B16.5 and MSS SP44 as appropriate. ISO 7005 (which AS4331 is a reproduction of) also includes European DIN flanges PN6/10/16/25/40 which were previously DIN 2501-1 and BS4504. These flanges are the same as EN1092 but EN1092 also includes higher rated DIN based flanges. Consequently in Australia most users simply just reference to original ASME B16.5 standards as this is already in use in Australia for the Oil, Gas and Mining industries and in fact in pressures above table E it has been the predominant standard in use for the last 30 years. However, piping engineers must refer to the new AS standard AS4331 for interpretations and specification requirements. Note in the case of AS4331.1/ISO 7005-1 ANSI equivalents they are not absolutely identical to ANSI but “deemed to comply and are designed to be interchangeable”. PN is the rating designator followed by a designation number indicating the approximate pressure rating in bars. PN ratings do not provide a proportional relationship between different PN numbers, whereas class numbers do. AS2129 originates from BS10 and has been metricated. In some cases slightly larger bolt holes provide better clearance as metric bolts are specified in lieu of UNC bolts used by BS10. AS4087 is an update of AS2129, however AS2129 is still widely used so it has not been deleted as a standard, however, it now only covers AS table D to H.
AS4087 is the latest standard for BS table D to H, the same drilling is used but the new PN pressure rating system has been adopted. As the new pressure ratings are slightly higher the flange thicknesses have slightly increased. Also the raised face dimensions (although rarely specified, flat face is mostly used) are slightly larger. Table C, J to R, no longer exist, PN16 is the same drilling as Table D, PN21 is the same as Table E, PN35 is the same as Table H.
AS4331 covers PN2.5 to PN420 and the sizing and drilling used is a replication of ISO 7005-1 which in turn is a metricated equivalent of ASME B16.5 class 150 to 2500. ISO 7005-1 also incorporates the superceded DIN 2533 & DIN 2501 flanges which AS4331 also incorporates (also mirrored in EN1092). AS/NZS 4331 is identical with and has been reproduced from ISO 7005. Although the standards say they are identical, I notice some very minor flange thickness differences between ISO 7005 (AS4331) and EN1092. Refer the Global Supply Line online slide rule above for differences. AS 4331 is a reproduction of ISO 7005 which is based on the American and European flange systems. 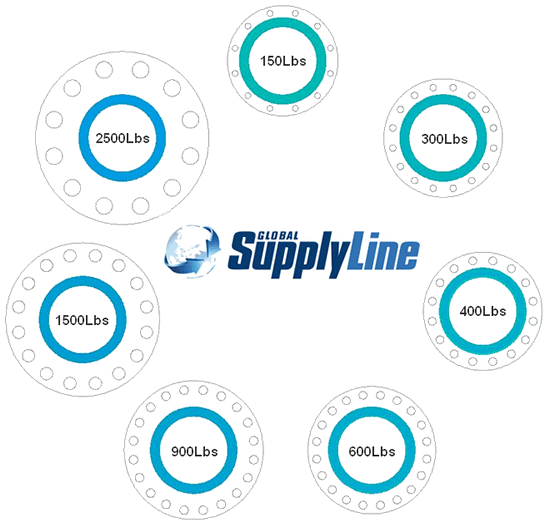 PN20, PN50, PN110, PN150, PN260 and PN420 Steel flanges are “designed to be interchangeable” with flanges to American standards ANSI/ASME B16.5 and MSS SP44. They are not identical but are “deemed to comply” with dimensions specified in ANSI/ASME B16.5 and MSS SP44 as appropriate. ISO 7005 (which AS 4331 is reproduction of) also includes European DIN flanges PN6 / 10 / 16 / 25 / 40 which were previously DIN 2501-1 and BS4504. These flanges are the same as EN1092 but EN1092 also includes higher rated DIN based flanges. Although the standards say they are identical, there are some very minor flange thickness differences between ISO 7005 (AS4331) and EN1092. Refer the Global Supply Line online slide rule above for differences. API6A flanging is used in Australia in oil drilling and wellhead systems. (see our oilfield slide rule click here. API ratings range from 2,000 to 20,000 psi (cold working pressure). ANSI was originally born from API, consequently in class 600 to 900 and 1500 ANSI the flanges are dimensionally equivalent to API 2,000, 3,000 and 5,000 in most sizes to ANSI 300NB (12”) API 13 5/8” but ANSI flanges being manufactured from lower yield strength carbon steel are rated to lower working pressure. However GSL stocks high yield carbon steel API6A 45K weld neck flanges which are compatible with ASME A234 WPB fittings and A106B/API5LB pipe. Click here to find out more. ASME (American Society of Mechanical Engineers, of which Australian Pipeline Valve is a member company) is a group of standards, which are in turn covered within the American Standards Institute (ANSI), hence their flanges can be referred to as ANSI or ASME class. Class is also traditionally abbreviated CL or LB (verbally spoken as pound) or cross hash (#) but not psi as this can be misconstrued as the cold working pressure (CWP). Since ANSI 150 for instance has a CWP of 285 psi, so unlike the PN system the class is not related to CWP. AS4331 has adopted ANSI drilling and sizes but uses PN rating classes. Consequently in some sizes flanges are thicker to bring the rating up to the required PN rating. A Class 300 flange is rated to a higher pressure than a Class 150 flange, because a Class 300 flange is constructed with more metal and therefore can withstand more pressure. However there are a number of factors that can impact the pressure capability of a flange. The Pressure Class for flanges is often expressed in ‘pounds’. Different names are used to indicate a Pressure Class. For example: 150 Lb or 150 Lbs or 150# or Class 150, all mean the same. Flanges can withstand different pressures at different temperatures. (Refer to pressure/temperature charts at this website for various material types). As temperature increases, the pressure rating of the flange decreases. For example a Class 150 A105 flange is rated to approximately 270 PSIG (1861 KPA) at ambient temperature, 180 PSIG (1241 KPA) at approximately 400ºF (204ºC) 150 PSIG (1034 KPA) at approximately 600ºF (315ºC), and 75 PSIG (517 KPA) at approximately 800ºF (426ºC). Consequently when the pressure goes down, the temperature goes up and vice versa. Additional factors are that flanges can be constructed from different materials, such as stainless steel, cast and ductile iron, alloy steel, carbon steel, etc. Each material has a different pressure rating. Below is an example of a flange NPS 12 (300NB) in all main pressure classes. This example demonstrates that diameter of the raised face are all the same; but outside diameter, bolt circle and diameter of bolt holes become larger in each higher pressure class. The bore is subject to the required schedule. Refer to our Flange Chart – ‘Online Slide Rule’ above for flange dimensions. The number and diameter (mm) of the bolt holes for the example below of 300NB is: 12 x 25.4mm Class 150, 16 x 32mm Class 300, 16 x 34.9 Class 400, 20 x 34.9mm Class 600, 20 x 38.1mm Class 900, 16 x 54mm Class 1500 and 12 x 73mm Class 2500. Pressure/temperature ratings are maximum allowable working pressures allowed as per ASME B16.5 (published in metric and imperial). For intermediate temperatures, linear interpolation is calculated by manufacturers. Pressure-temperature ratings apply to flanged joints which may be reduced by gaskets or studs used. The temperature shown for a corresponding pressure rating is the temperature of the pressure-containing shell of the valve or flange. In general, this temperature is the same as that of the media in line and the external environment, whichever is greatest (but also lowest temperature of each must be factored for low temperature service). For any temperature below -29ºC, the rating shall be no greater than the rating shown for -29ºC, depending on materials the rating can be lower. The below two tables are examples of two material groups according to ASTM, flange pressure-temperature ratings to ASME B16.5 – 2009. (1) Upon prolonged exposure to temperatures above 425ºC, the carbide phase of steel may be converted to graphite. Permissible but not recommended for prolonged use above 425ºC. (3) Do not use over 260ºC. (1) Do not use over 425ºC. LB is the origin of the Latin word Libra (weighing scale) a Roman unit of mass similar to a pound, hence this has been adopted as another way of saying Class. Never say PSI as this can be confused with API 6B flanges which are rated by PSI (CWP). AS2129 Still in use but now only covers Table D to H (Table C now obsolete), Table J to T now replaced by AS4331 which is a replication of ISO7500-1 which in turn is equivalent to ASME 150-2500 class ANSI B16.5). AS4087 is the new standard covering Table D to H. The same drilling is specified but the PN rating system is used (PN16 to PN35). For ANSI 150 to 2500 class flange pressure/temperature ratings refer to the forged pressure/temperature ratings showing in the following link.